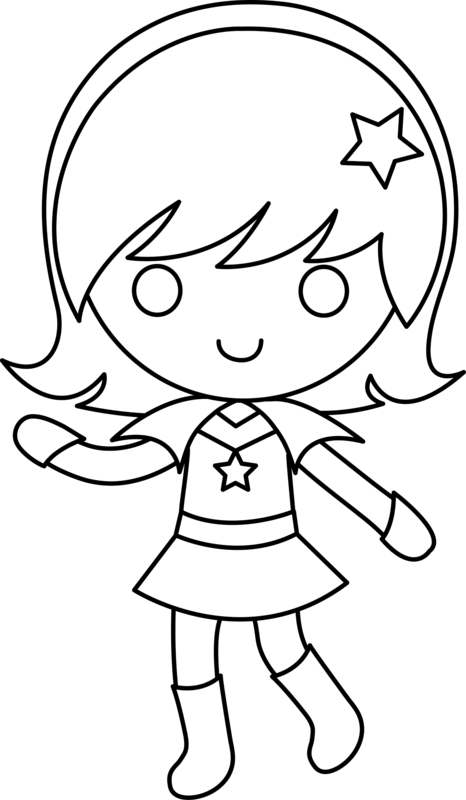 This is an image of a "space cadet." For those of you that caught my original entry on the 21st Stop of my Bakery Traveler World Tour, you might have noticed that I, well, actually, goofed. Can I blame jet lag? I am a traveling gal, after all! I have fixed my 21st Stop to read Bolivia and not...Brazil. But, gee, I will be stopping at Bosnia and Botswana first. I cannot stop eating these cocadas from Bolivia. These Cocadas, also known as "Coconut Candies," are a common treat in Bolivia. As you may know by now, I am all about the easiest international dessert and baked good recipes. This one, from here, fits the bill. 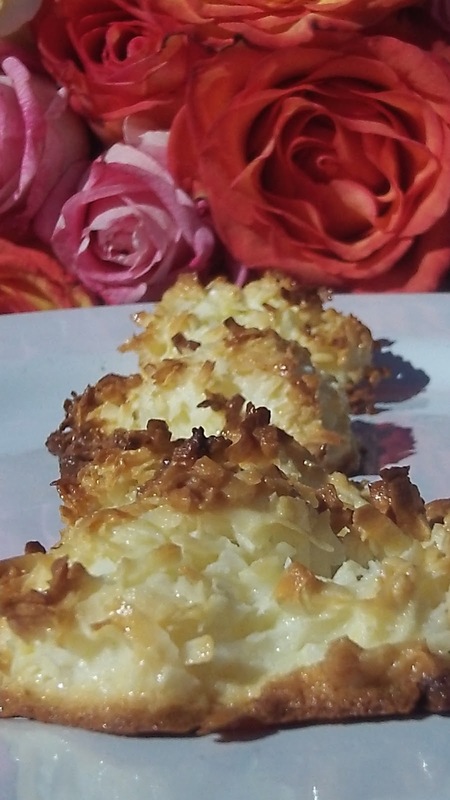 Plus - these are so incredibly tasty in a chewy, sweet, toasty coconut-y way. Little Bakery Travelers could help make these and they only take about 20 minutes to bake. Do check your treat 20 minutes in. The first batch I baked for 25 minutes and that was too long. Still good, but probably too crispy. The second batch, some seen in photos here, needed only 20 minutes and were like coconut heaven. 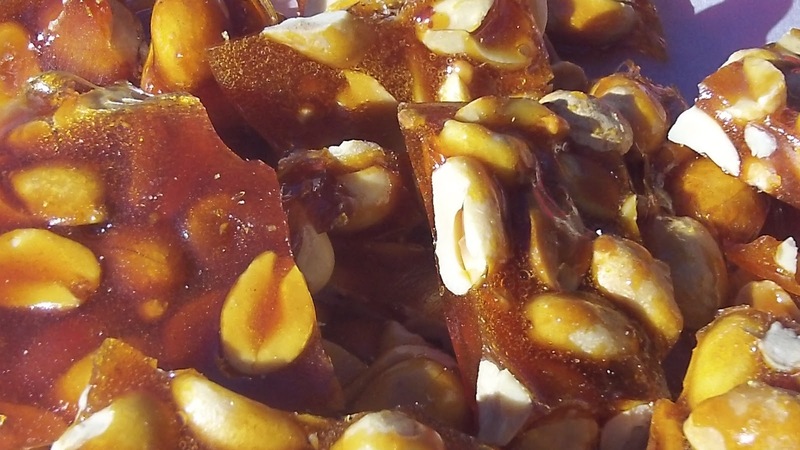 January 26 is National Peanut Brittle Day. Coincidentally, I had the pleasure of making a version of peanut brittle from the African country of Benin very recently. If you are in a peanut brittle mood, what better day to honor that mood than January 26? Check-out my little blog entry on Benin's Confit d'Arachide (or candied peanuts) here! You will love this three ingredient charmer. For some more history on brittle, read this. I had no idea this had Celtic origins. 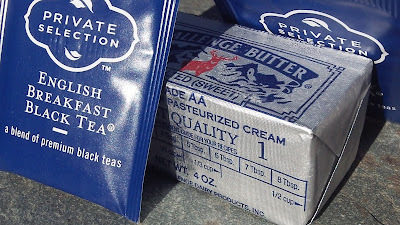 Yes, Virginia, there is a Butter Tea. And it is from Bhutan, and people drink it for its high fat content (because, hello, it's like super freezing there with all those snowy mountains and fat calories can be good, as well all know) and they drink it for its moisturizing qualities (a little butter lip balm never hurt anyone) because the weather will freeze and dry you up. 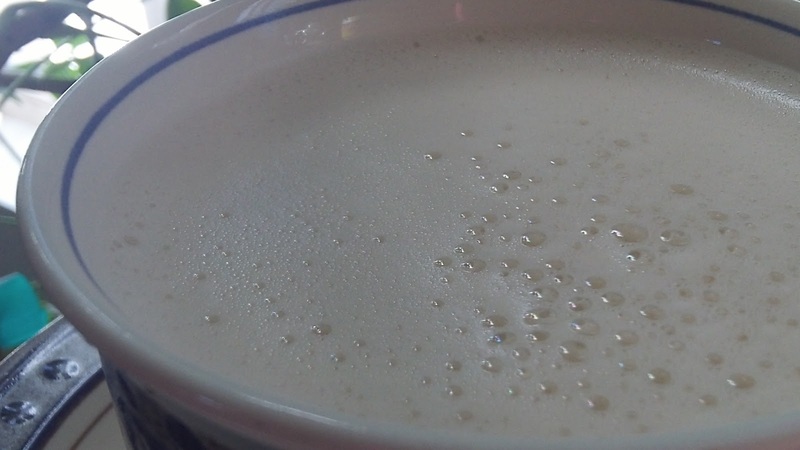 Butter Tea can renew one's hiking spirit, they say. Thankfully, the recipe I found for this tea said it is okay to use cow butter. Now, that, I've always got on supply. The tea required for this concoction is an easy to find black tea. So far, so good. Easy ingredients, easy directions. First, you boil water, then simmer a couple of tea bags for five minutes. Then you melt the butter. Next, you add the butter, some salt and some milk to the tea, and blend it all together. Doesn't take long. My conclusion? The taste is definitely an acquired one. Perhaps I live in the wrong climate to appreciate Butter Tea. 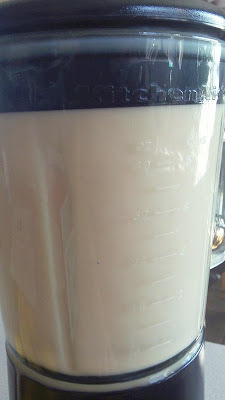 However, I did get an idea after sipping this stuff: black tea, butter, and salt could make a gourmet popcorn seasoning. Yes, you heard it hear first folks. My idea! I got the recipe and learned a little more about Bhutan here. Lemon, sugar, and peanuts make such pretty and simple ingredients. 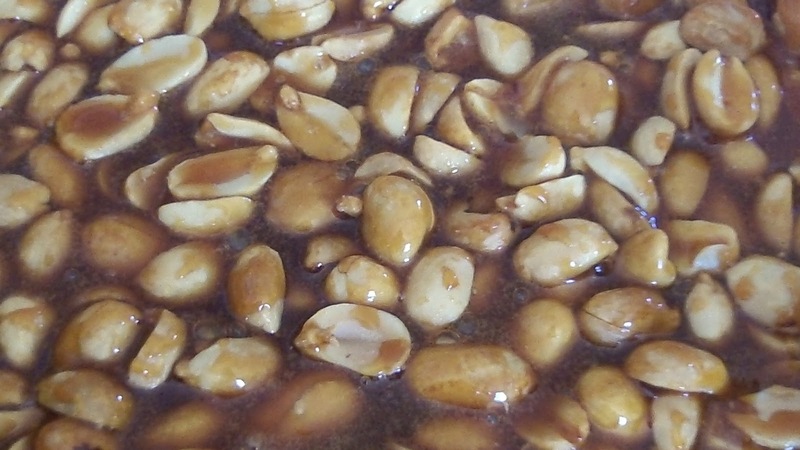 You cannot go wrong with trying Confit d'Arachide (Candied Peanuts) from Benin. It is basically a simple, and perfect little peanut brittle recipe. 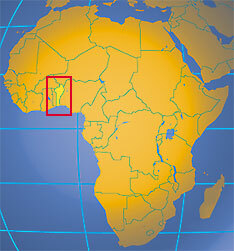 Benin is in West Africa. The above territory became a French Colony in 1872 and achieved independence on 1 August 1960, as the Republic of Benin. 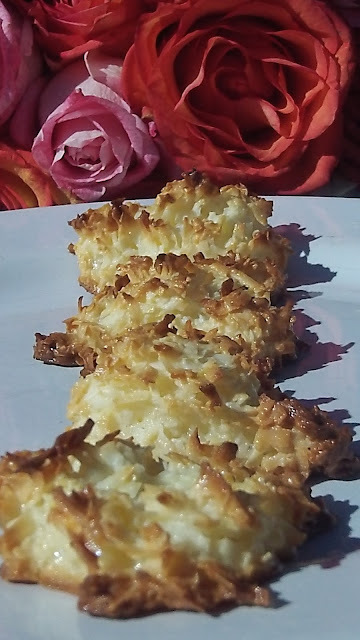 You see the French influence in many of the country's recipes, like with the one I share here today. Below, the sugar heats up and melts into a loose honey-like consistency. 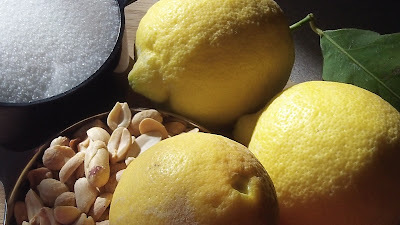 Then the lemon juice and peanuts are stirred into the melted sugar. 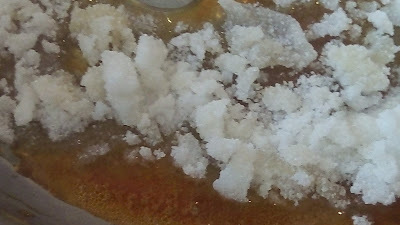 This mixture is poured onto an oiled baking tray (although I used a parchment-lined tray...less mess). Once the mixture has cooled off, it is broken into pieces and stored in an air-tight container. Super easy and super yummy. What the fudge? It's colder here in Phoenix than it is in New York today?! Cold weather equals comfort food. Comfort food equals heavy meals. All good, all wonderfully comfy, and all justified. Mother Nature's power never seizes to amaze. In the dessert realm, fudge is up there in comfort food royalty. Today, fudge reigns supreme. If you need a fudge fix you must go to Florence Fudge Co. in Florence, Arizona. I recently stopped there for a little day trip and felt like I had gone to a town that the wild west certainly has not forgotten. Chocolate Fudge with Walnuts - all dressed up and ready for a party. If you like walnuts and chocolate, you will love this inspired treat. Mint Chocolate Fudge - a dense slice of thin mint heaven, with one of the prettiest mint green bottoms this side of the Mississippi. Snickers Fudge - OK, that's just comfort food genius and if you love Snickers, then you will love its relation here. Butter Pecan White Fudge - butter and pecans is its own private confection - all elegant and full of manners. Bakery Travelers: FUDGE is NOW. Go to Florence and get the real deal in all sorts of hand crafted flavors. I'm keeping with an adventure theme for my Monday Morsels this month. Alice in Wonderland - isn't she the epitome of an adventurous spirit? I so love that she's tiny among the plate in the background in the photo above. Somehow, that seems very fitting for how it feels to tackle my bakery travels on occasion. I realize how big this world is, and then I try a new dish or two, and before I know it, the world seems a lot more...well...small in a very sweet, sweet way. I call this photo the "Congress Cake" because I took it here. The cake may not seem like much to many, but I took the photo as I was just starting this blog, actually. While I am fully aware that my blogging skills still rest in the novice spectrum, my fellow bakery travelers, it remains one fine, worthwhile adventure. 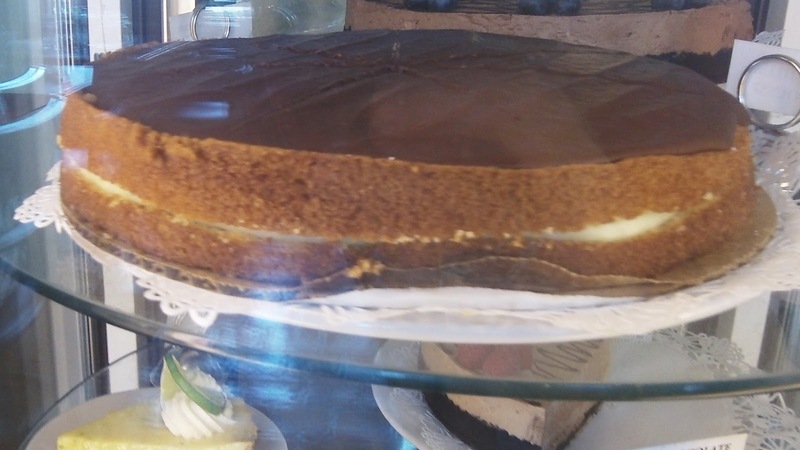 Besides, how delicious does this cake look? You can now follow me on pinterest as Bakery Traveler. See you there! Lots more Bakery Traveler adventures on the way for 2013! I'm looking forward to sharing them with you.